In this photograph you can see the very first copies to be printed of a book that I spent most of last year working on. 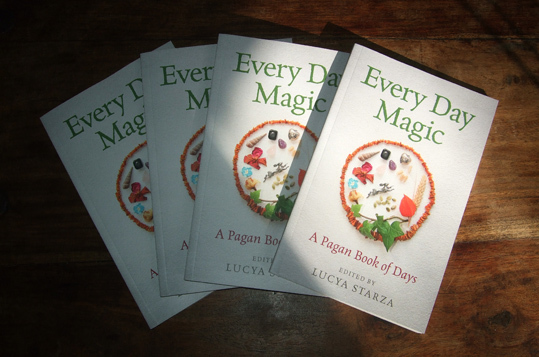 It is called Every Day Magic - A Pagan Book of Days and contains contributions from nearly 50 pagan authors and practitioners from many different traditions across the world, including Caroline Wise, Elen Sentier, Ellen Evert Hopman, Geraldine Beskin, Melusine Draco and Rachel Patterson. Every Day Magic - A Pagan Book of Days contains 366 spells, rituals, meditations, Pagan prayers, divinatory techniques, poems to read and recipes and craft projects to try out, along with the details of festivals that take place throughout the year. All the activities are intended to be easy to follow so you can pick up the book, open it to a day and find something you can do. There are festivals from the ancient world and modern Pagan celebrations as well. As well as coming up with the idea for Every Day Magic, I edited and contributed to it. However, as it is a community book I will not be receiving royalties - I asked for any money raised from it to be used to help bring more pagan writers' works into publication. The book isn't due to be officially launched until November 24, but you can put in pre-orders. The RRP for the paperback is £8.99 in the UK and $14.95 in the US, while the e-book should be £3.99 / $5.99. The ISBN is 978-1-78535-567-7. The photo shows a few early copies I was sent as samples of the printing. This makes me want to write a book! Rebecca - thanks! Willow, do write a book!